Excluding a one-off item of SEK 520m, the transaction of SEB's Visa memberships in the Baltic countries, operating profit for the second quarter was SEK 5,016m (4,493) corresponding to a return on equity of 11.9 per cent. Including the one-off item, operating profit was SEK 5,536m and the return on equity was 14.0 per cent. "In the prevailing environment of uncertainty, customers' need for advisory and risk management services have continued to increase. 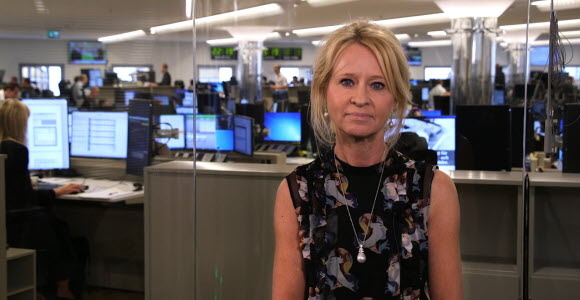 This is reflected in higher net fee and net financial income between the second and the first quarter" says Annika Falkengren, SEB's President and CEO, commenting on the quarterly result. However, for the first half of this year and excluding both positive and negative one-off effects, all income lines were lower compared to the first half of 2015 mirroring the impact of negative interest rates and a more cautious business sentiment. The market environment is challenging but we are determined - and well positioned with our diverse business mix and strong balance sheet - to support our customers." Operating income excluding the one-off item amounted to SEK 10.6bn, an increase of 4 per cent compared to the first quarter this year. Operating expenses decreased by 2 per cent to SEK 5,332m, excluding one-off items in the first quarter. Asset quality remained high. The net credit loss level was 6 basis points during the quarter. The liquidity coverage ratio was 129 per cent (128). The capital position was strong with a Common Equity Tier 1 capital ratio of 18.7 per cent (18.8). This is information that Skandinaviska Enskilda Banken AB (publ.) is obliged to make public pursuant to the EU Market Abuse Regulation. The information was submitted for publication, through the agency of the contact persons set out above, at 7 am CET, on 14 July 2016. SEB is a leading Nordic financial services group. As a relationship bank, SEB in Sweden and the Baltic countries offers financial advice and a wide range of financial services. In Denmark, Finland, Norway and Germany the bank's operations have a strong focus on corporate and investment banking based on a full-service offering to corporate and institutional clients. The international nature of SEB's business is reflected in its presence in some 20 countries worldwide. At 30 June 2016, the Group's total assets amounted to SEK 2,677bn while its assets under management totalled SEK 1,657bn. The Group has around 15,500 employees. Read more about SEB at http://www.sebgroup.com.